Home >Blogs > Can Dentistry Be Anxiety-Free? Are you afraid of the dentist? You aren’t alone. As many as one in five Americans avoid the dentist because of their dental anxiety. But do you know why you have this fear? We know that television and the movies don’t always portray dentists in the best light. You may remember Steve Martin’s turn as “Dr. Scrivello, DDS” in the movie version of The Little Shop of Horrors. Even in the children’s film Finding Nemo, the dentist is pretty much a villain in the story. The dentists at our Sunrise Dental locations in Cary, Chapel Hill, Durham, and Raleigh are more caring and more compassionate than what you may expect. Our dentists want to make your dental care as comfortable and relaxing as we can, which is why we take extras step to help all our patients, especially those who may be dealing with dental anxiety. Longer Appointments One of the ways we try to make dental care easier is by offering longer appointments for patients who are anxious about dental care. This way, you won’t have to feel rushed to finish your procedure as soon as you can. Just let your dentist know that you need a break if you start to feel overwhelmed or nervous. We have found that breaking up treatments into smaller, more manageable segments allows many patients to complete their procedures in a single visit. And you should always feel free to ask questions. Ask questions when you call to make your appointment. Ask questions when you arrive at our office. Ask questions in the middle of your treatment. Knowing what we are doing and why we are doing it may make it easier for you to accept dental care. Privacy Is Important It’s important to us to respect our patients as well. At each of our locations, we offer one or more semi-private operatories. These operatories are located at the end of the hall to provide discreet care for patients who feel more comfortable a private setting. Please let us know of a more private setting would help you feel more relaxed so we can do our best to make your visit as comfortable as possible. Sedation Options For patients with higher levels of anxiety, we also know that it may take more than longer appointments and semi-private rooms to ease their concerns. We offer two types of sedation dentistry at our office. These options are great for patients who know the importance of dental care but need some assistance getting comfortable. ► Nitrous oxide “Laughing gas” may be the fastest and simplest form of dental sedation. When you sit down in one of our chairs, we can turn on the gas for you. You will start to feel the effects almost immediately. Nitrous oxide induces a euphoric state when you inhale nitrous oxide. Your worries and fears drift away, and you are able to remain calm throughout your cleaning or other procedure. You may not fall asleep completely, but your visit may seem more like a dream. When you are finished, all we have to do is turn off the gas. You will breathe out any remained nitrous oxide, and you will feel like yourself in just a matter of minutes. Your teeth will be clean, and you won’t have to worry about any lingering effects from the sedation. 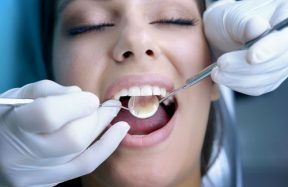 ► Oral conscious sedation This is a more powerful form of sedation, and you may prefer this option if you have severe dental anxiety. You should be aware that if you receive oral sedation, then you will need someone else to drive you to and from our office. You will take a pill on the day of your appointment. We want to give the pill time to take effect before we start your procedure, which is why you will need someone else to bring you to the office. By the time you sit down, you may be very drowsy, or you may even fall asleep. Many patients don’t remember anything about their dental care while they are under oral sedation. Set Up a Free Consultation Before you schedule a cleaning at one of our locations, come in for a free consultation first. We want to learn how we can make your dental experience more comfortable and relaxing. Let us know if you would be interested in a longer appointment or if privacy is important for you. Ask any questions you have our about our sedation options. Whether you visit the Sunrise Dental in Cary, Chapel Hill, Durham, and Raleigh, all our dentists all want to provide quality care in a comfortable setting. To schedule your free consultation, call the location closest to you or click on the name to request an appointment online.